The Cdks are serine/threonine protein kinases which are predominantly involved in the progression of the cell cycle. Subsequently, CDK-cyclin complexes (CDK7, CDK8 and CDK9) were also identified as conserved components of the RNA polymerase II transcriptional machinery. CDK7, cyclin H and a third subunit, the RING finger protein MAT1 associated with transcription factor TFIIH and phosphorylates the C-terminal domain (CTD) of RNA polymerase II, resulting in a progression of transcription from the preinitiation to the initiation stage. 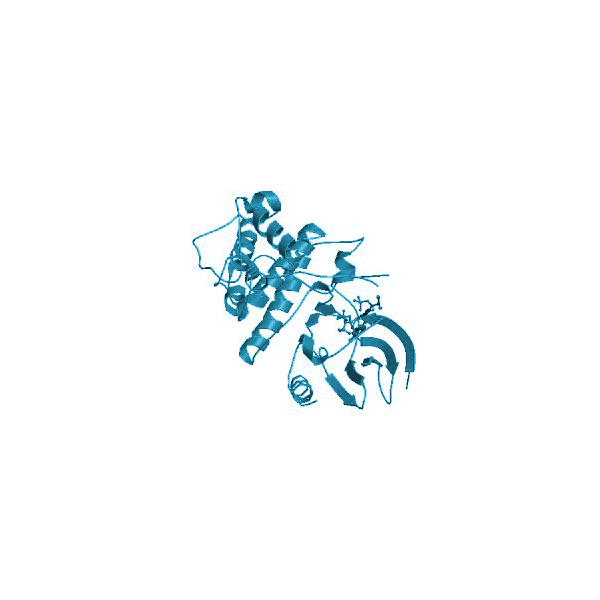 Additionally, CDK7 together with CycH and MAT1 forms the CDK activating kinase (CAK) complex, responsible for the activating phosphorylation within the T-loop of CDK1, CDK2, CDK4 and CDK6. Fisher RP. (2005) "Secrets of a double agent: CDK7 in cell-cycle control and transcription." J Cell Sci. 15; 118(Pt 22):5171-80. Lolli G, Johnson LN. (2005) "CAK-Cyclin-dependent Activating Kinase: a key kinase in cell cycle control and a target for drugs? Cell Cycle; 4(4):572-7. Harper JW, Elledge SJ. (1998) " The role of Cdk7 in CAK function, a retro-retrospective." Genes Dev. 1;12(3):285-9.